For the last couple of years now fireglass for fireplaces, fire pits, fire tables, fire bowls and other home and hearth products have become increasingly affordable and diverse. Ranging from several colors and premixes, customers no longer have to stretch out their wallets to replace traditional type product such as lava rocks or logs. With a broad line of 1/4″ tempered glass, customers have flexibility to browse colors that will essentially go along with their color scheme of choice. Restaurants, resorts and luxurious hotels were the first to experiment with tempered glass in place of traditional product and quickly gained fame opening eyebrows as to what it was called and where to buy it from. Names such as glass crystals, fireglass, firepit glass and broken fire glass crystals were the first to surface the market. Once consumers caught on a new trend was created where broken tempered glass was being used as a substitute in place of lava rocks and logs. Existing fireplaces, fire pits, fire tables, fire bowls and other hearth platforms were being completely transformed and rejuvenated with fireglass crystals. Moreso, fire glass has now gained far more popularity especially with its price tag be lowered as low as $2.65 per pound. Luckily for Glaz Chips Fire Glass, glass product isn’t outsourced nor does it come from glass recycled bins. Manufactured by Glaz-Tech Industries, Glaz Chips Fire Glass is properly tempered, tumbled and polished to avoid injury from sharp edges all the while retaining heat. Being that these fire glass crystals are manufactured in-house, Glaz Chips makes for extremely competitive pricing over the web. Browse throughout the current lineup of glass colors and premixes to give you an idea on how you can rejuvenate and breathe life into an existing or new modern fireplace. How much of your fire glass do I need for a fireplace? What if I have an indoor fireplace and an outdoor fire pit? Glaz Chips has developed a fireglass calculator to let you know how much you’ll need. We recommend at least a 2″ minimum depth worth of fire glass crystals for any platform whether be a indoor fireplace, outdoor square or round fire pit. As a quick tip and reminder to save you money, in the event that your fireplace exceeds 2″ in depth you can always purchase clear glass as a filler since you won’t realistically see it below. Or many customers have also purchased sand or rock to fill up the space leading to the suggested 2″ minimum. Visit our contact page in case you have further questions on the structure of your fireplace or fire pit. Does the flame change color depending on the color I choose? Unfortunately the answer is no. The glass color you decide to choose does not change the color of the flame. Before changing out my lava rocks, what are the benefits of using glass for my fire pit? Fire glass can be viewed as a substitute for traditional products such as lava rocks and logs. It is a green eco-friendly product that doesn’t leave the mess that other products do. Since the glass is tempered it does absorb heat and remains hot after being lit making it an ideal product during cold weather. The variety of colors, reflective glass and premixes allows for creativity and thus transforming and designing your fireplace or fire pit. Fire glass doesn’t create ash, soot or emit toxins into the air and has far more longevity when compared to other traditional products. Visit us online today, glazchipsfireglass.com and see for yourself the potential of recreating your fireplace with new and modern glass crystals. Categories: decor, fireplace | Tags: design, fire bowls, fire pit glass, fire tables, fireglass calculator, fireplace decor, fireplace glass, fireplaces, glass crystals, hearth products, modern fire pits, new fireplaces | Permalink. 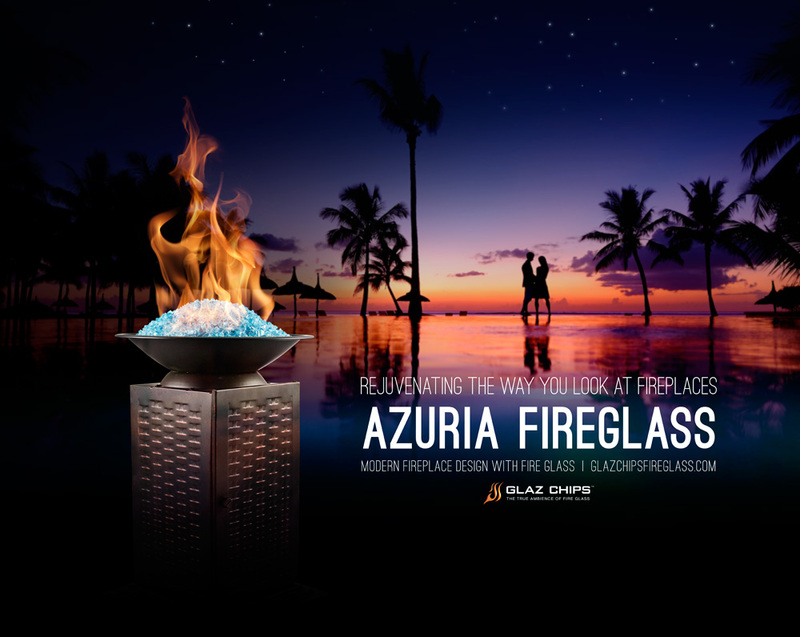 Glaz Chips Fire Glass is now offering its fireplace glass at a discounted price. Its clearance section hosts a limited and beautiful supply of fireplace glass crystals. So what’s the difference or why is it on clearance to begin with? This short supply of glass crystals have either been experimental mixes or colors that never saw the light of day on our full line of advertised products. This limited supply of product makes for a great start for beginners with small to medium fireplaces or fire pits. It will definitely work well with small props bought at local hardware stores such as fire bowls and fire tables that can serve as a substitute in place of dirty logs and lava rocks. Act today and take advantage of these discounted deals for your personal use or simply use it as a gift!!! Visit our fireplace glass clearance page for additional glass colors and availability. These fireplace glass clearance items have been properly tempered, tumbled and polished to ensure its safety and longevity. The tempering process also prevents the glass from peeling, popping and emits no smoke or ash. Due to its process it also absorbs heat making it an ideal product for fireplaces, fire pits, fire bowls and fire tables. Categories: Clearance, Fireglass Sales | Tags: clearance, discounts, fire bowls, fire glass crystals, fire pit glass, fire pits, fire tables, fireplace decor, fireplace glass, fireplaces, glass rocks, glass stones, modern fireplace | Permalink. 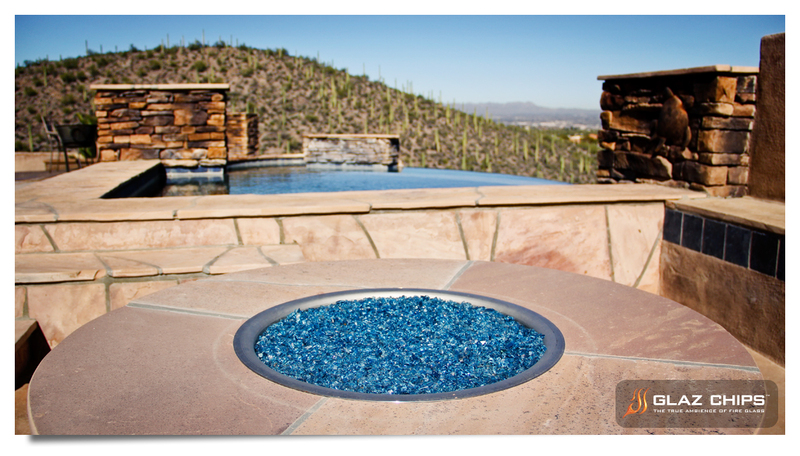 Beautiful 20″ diameter fire pit pictured with our vibrant Aqua Blue Fire Glass. The interest for fire glass is already gaining momentum in the Western and Southern States with Spring like conditions. As you can see from the picture above, Glaz Chips Fire Glass products stand out just as beautiful and vibrant in the daytime than nighttime. It’s color characteristics are truly luscious in comparison to standard lava rocks or logs. This alternative option for decor is extremely versatile and thus has been given a lot of interest due to its clean, low maintenance and crystal like attributes. The season continues to gather your family and friends. Why not do it outdoors around a cozy and modern fire pit! One of the questions a home owner or designer may not immediately inquire about is the effects of using natural or propane gas with Glaz Chips Fire Glass. The fact is natural gas is a preferred application for any of our fire glass colors. Reason being that the characteristics of natural gas are cleaner in comparison when using propane gas. If you are new to any of these applications just imagine the effects of a bbq grill that utilizes propane gas. In time, due to the chemistry of propane, you would eventually see a build up of soot or a dirty build up accumulate on your grill therefore requiring a thorough cleaning before your next bbq. The same applies to a fireplace or fire pit. Although the effects of using propane does not take place immediately, rest assure that in time you would see a build up or dirty film accumulate on your fire glass. Even though Glaz Chips recommends using natural gas as your source of lighting your fireplace, propane is still manageable and can be used. 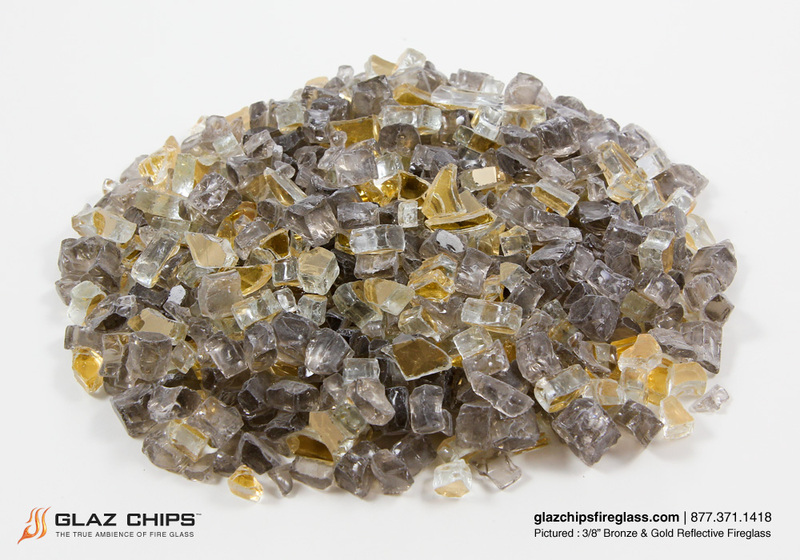 If using propane, however, Glaz Chips Fire Glass recommends selecting dark colors. Please see our recommended list of fire glass colors and mixes below when utilizing propane gas. Categories: decor, fireplace, Outdoor Fire Pit | Tags: blue fire glass, fire glass, fire glass crystals, fire pit decor, fire pit glass, fireplace glass, home and hearth, modern fire pits, modern fireplaces | Permalink. For the month of December, Glaz Chips Fire Glass is offering a 15% discount on all fire glass for your fireplaces and fire pits. The discount does not end there, we are also applying the discount to hardware and gift certificates. Categories: Uncategorized | Tags: christmas ideas, discounts, fire pit glass, fireplace glass, fireplace glass stones, glaz chips, holiday season | Permalink.